Primedices blue and white theme is gentle on the eye and provides a calming feel. When I open the site, I immediately see what I need and I get no feelings of confusion or frustrations from playing. To create a roll number, Primedice uses a multi-step process to create a roll number 0-99.99. Both client and server seeds and a nonce are combined with hmac-sha512(server_seed, client_seed-nonce) which will generate a hex string. The nonce is the # of bets you made with the current seed pair. First five characters are taken from the hex string to create a roll number that is 0-1,048,575. If the roll number is over 999,999, the proccess is repeated with the next five characters skipping the previous set. This is done until a number less than 1,000,000 is achieved. In the astronomically unlikely event that all possible 5 character combinations are greater, 99.99 is used as the roll number. The resulting number 0-999,999 is applied a modulus of 10^4, to obtain a roll number 0-9999, and divided by 10^2 to result a 0-99.99 number. 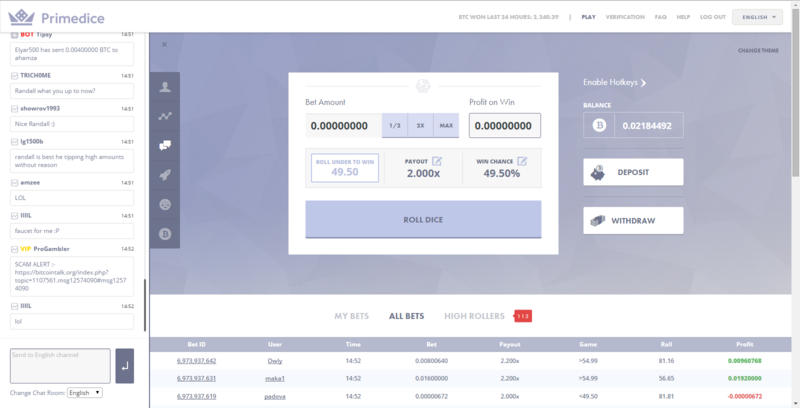 The community at PrimeDice is probably one of the oldest and most loyal communities in the bitcoin gambling scene, with members going back to the launch of primedice 1.Most users are friendly and helpful. Begging and rude behavior in general is frowned upon by the users and the mods quickly act upon it, as well as spamming. Begging in PM is quickly found and and acted upon.The moderators at PD are reasonable and I have not personally witnessed any one of them abusing power in any way. I've not had any issues with them and I commend them for their good work in keeping the chat clean and respectable. Stunna and Edward are not extremely active on the site from what I can see, but they are both widely trusted. My dealings with them has always been kind and to the point. They've treated me with respect and never seemed to be looking down on users.In the few visits to the chat I've witnessed, they were kind and respectful to their users and often "rained" on others. I like PD and have had many interesting conversations in the chat there. I've not had the greatest of luck at PD, but at least one of my accounts there are in profit :). The bets I have checked and verified were all indeed provably fair.I feel Stunna and Edward could be a bit more involved in the chat, but I might just be missing them when they're online.Overall, PD is a good, fast and fair site to gamble your coins away on.